Austrake Milanese Wrist Bands with Magnet Lock for Fitbit Alta HR/Fitbit Alta, upgrades your taste for any occasion by the excellent and unique design. Band Size: Wrist size 6.7 -9.4 inches (170mm-240mm). You will get 1 year warranty and quality assurance, please feel free to contact us for any quality issue. Replacement or full refund does not need return. We provide friendly customer service, all you questions or e-mails will be replied within 12 hours.? HIGH QUALITY & ADJUSTBALE: Made of High Quality Stainless Steel. It's Comfortable and Durable. Adjusting the Band Length by the Magnetic Closure. SIZE: Fits Fitbit Alta HR/Fitbit Alta perfectly, Wrist Size 6.7" - 9.4" (170mm-240mm). SIMPLE & FASHIONABLE: Easy to Install. With Excellent and Fashionable Design, Suits Women/Men for Leisure Places. PACKAGE: TRACKER Not INCLUDED. 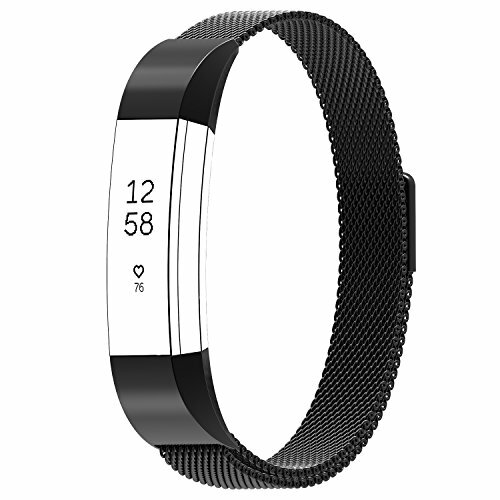 1*Austrake Fitbit Alta HR Milanese Band , 1*Austrake Package. WARRANTY : 1 Year Warranty and Quality Assurance. Please Contact Us for Any Quality Issue. Do Not Need Return for Replacement or Refund.